ABOARD THE VIKING SKY – At first, I thought it was a make-believe story. When I was a child, the neighborhood storyteller Miss Minnie mesmerized me and my siblings with the exploits of an extraordinary dog. As soon as I got a chance to go to the school library, I looked it up. The story was true. Bamse was a real live World War II hero. Now my Viking Sky cruise will be docking in the Norwegian port of Honningsvag where Bamse once lived and where a big statue of Bamse stands on the dock. That would be my first stop, I decided. Obviously, many other passengers decided the same thing. The Bamse statue was a photo favorite when passengers came ashore. I don’t know if people knew the Bamse story or if they just wanted a photo with the lovely statue. In the case of Larry Stewart of New York, Bamse’s exploits were told to him by his father, a World War II veteran. The story started in 1937 when a St. Bernard dog named Bamse (Norwegian for teddy bear) was adopted by Honningsvag harbormaster Erling Hafto. A big gentle dog, Bamse loved local children and children of all ages loved him. In the summer, children would ride him like a pony and in the winter, they would have him pull their sleds. When the harbormaster’s 3-year-old daughter became ill and doctors feared she would die, it is said that Bamse curled up with the deathly-ill child and she survived. Some folks credited Bamse with the miraculous recovery. When World War II broke out in 1939, the harbormaster was called to active duty. Hafto took his faithful dog with him. Stationed in Dundee and Montrose in Scotland, the ship was used as a minesweeper. Bamse was made an official member of the Royal Norwegian Navy. Photographs of Bamse wearing a Royal Norwegian Navy sailor’s collar and cap or a special metal helmet were sent to Norwegians around the world to lift their spirits during such a horrible time. Bamse became a guardian for the crew and would stand watch in the foremost gun tower just like any other sailor. During his downtime, Bamse would go ashore where, of course, local children adored him and townspeople accepted him as one of their own. People thought nothing about a dog boarding the bus for a ride. Crew members even bought Bamse a bus pass which he wore around his neck so he could board the bus to sit on the top deck. Bamse even knew which pubs the crew liked to frequent and he would follow along to keep a watchful eye on his men. It is said that if one of his crew started to get in a pub brawl, Bamse would put his front paws on the brawlers’ shoulders. That would be the end of it. Bamse was credited with saving the lives of two of his crew members. While walking along the quayside, the ship’s commander was attacked with a knife. Seeing the attack, Bamse bounded up the quayside and knocked the attacker into the water. In another instance, a crew member who was believed to be drunk fell overboard. Bamse was the only one who saw the fall and jumped into the water after him to keep the man afloat. Bamse’s loud barking drew the attention of the men who pulled the sailor and the dog aboard. Bamse was only about 7 years old when he died of heart failure on July 24, 1944. Wrapped in the nation’s flag, the heroic dog was buried with full military honors in the sand dunes of the river in Montrose. Schools closed for the day so hundreds of children could attend the funeral along with Norwegian sailors, servicemen and townspeople. In 2006, Bamse was posthumously awarded the People’s Dispensary for Sick Animals Gold Medal, known as the animal’s George Cross for his role in raising Allied morale during the war. The harbormaster’s daughter, who Bamse is said to have saved during her deathly childhood illness, accepted the award on the family dog’s behalf. 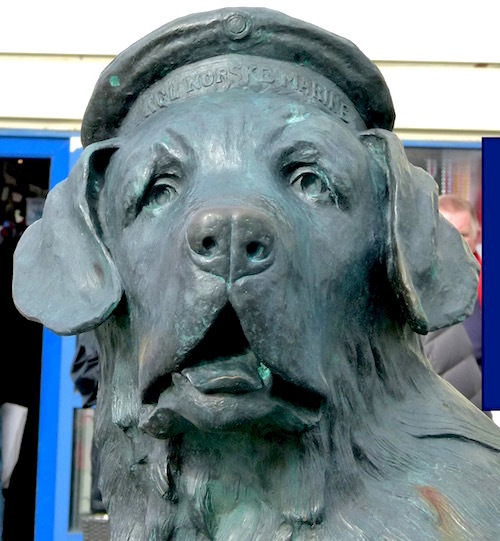 Prince Andrew dedicated a statue to Bamse in Montrose. 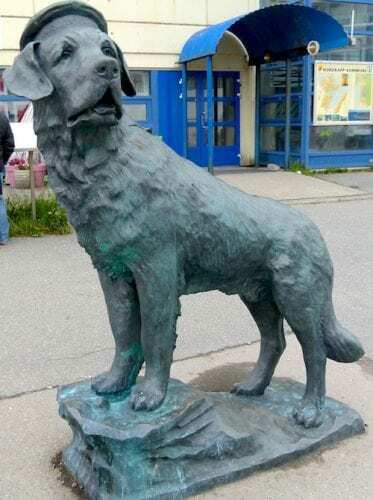 A similar statue was erected in Bamse’s hometown in Honningsvag. That is the one I am seeing on my cruise port stop. You just never know what treasures travel can add to your life. This is certainly one of mine on this wonderful Viking Sky cruise.